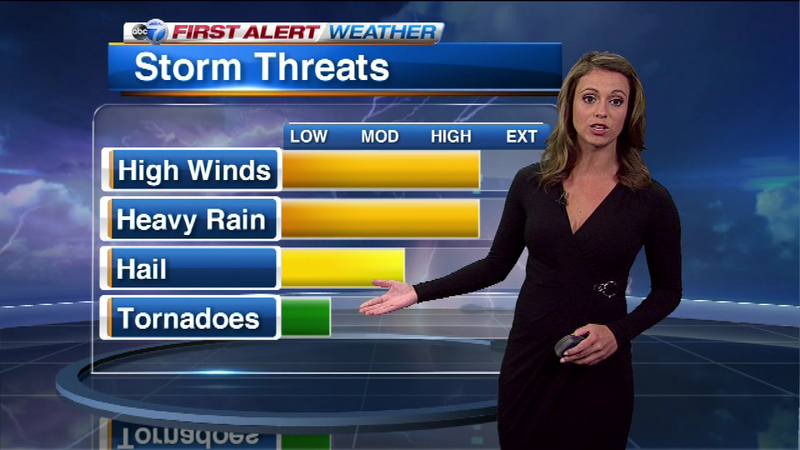 Severe weather is possible in the Chicago area Monday night, ABC7 meteorologist Cheryl Scott said. CHICAGO (WLS) -- A cold front is moving through the Chicago area Monday night, bringing heavy rain, gusty winds and a drop in temperatures. The first round of rain moved through the city and suburbs on Monday afternoon. The wet weather impacted flights at O'Hare, where over 100 flights were canceled and delays averaged 45 minutes. No delays or cancellations were reported at Midway Airport. A second round of storms, expected late Monday night, will bring the greatest chance for heavy rain. Isolated areas will see an additional 1 to 2 inches of rain overnight. Partly cloudy and mild Thursday with scattered evening showers. Highs in the 60s, and as high as 70 to the west.